After Squawker Lisa and I lost our jobs at the New York Daily News website in 2008, I stopped reading the paper for awhile. But eventually nydailynews.com resumed its place as an essential part of my websurfing day. And the main reason was the sports section. In 2000, Ethan created a massive web package celebrating the classic back (and sometimes front) pages of The News' sports coverage. I contributed two pieces. One was on the 1969 Mets winning the World Series. The other, appropriately enough for this Subway Series weekend, was on the first time the Mets and Yankees ever played, an exhibition game that made both the front and back page on March 23, 1962. A sellout crowd in St. Petersburg, FL came out to see Casey Stengel, fired by the Yankees two years earlier despite winning 10 pennants and seven World Series in 12 years, lead the newborn Mets against the Yankees, who had just left St. Pete to train in Fort Lauderdale. They were heavily pro-Mets, these people who for years had rooted for the Yankees. They didn't boo the Yanks for their defection to Fort Lauderdale (except for Maris, who got a few razzes) but their hearts are with Ole Case. He could manage the Rinkeydinks and they'd be on his side. After the Mets beat the Yankees in the bottom of the ninth, Young described how jubilant former Giant and Dodger fans packed New York bars, including the legendary Toots Shor's, to celebrate. 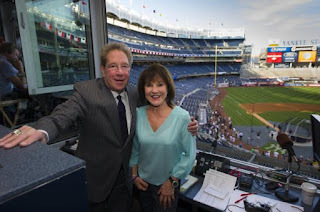 "It's like New Year's Eve in this joint," Shor yelled to Stengel over the phone. Through the years, you could always count on Daily News sports columnists for their unique voices and feel for the city. As with Young, I didn't always agree with what Bill Madden and Filip Bondy had to say, especially Bondy's Met-bashing. But when Bondy covered international events such as the Olympics or Wimbledon, I would often read his entertaining dispatches about his experiences on the road ahead of the actual event coverage. When I was at the paper, the biggest regular-season Mets-Yankees Subway Series ever would have meant a special section with lots of extra content and a cover cartoon from Ed Murawinski. I still have my T-shirt with the cover Murawinski drew for the 2000 World Series. It is impossible to imagine this weekend's Subway Series without Madden, Bondy and Murawinski. It is impossible to imagine the sports section without other longtime writers such as Wayne Coffey, Hank Gola and Roger Rubin. Just last week, Coffey broke the James Blake-NYPD story. Those of us who still care about the steroids issue could always count on Teri Thompson's I-Team to pursue the issue. Now Thompson, too, is gone. For most of my time at The News, the web staff was largely separate from the print edition, so I hardly ever saw most of the people mentioned here, but I was fortunate to have the chance to work with Teri in getting I-Team exclusives up on the site. Teri saw the potential of the site to break news at a time when some on the print side sill saw the web as trying to scoop the paper, rather than as part of the same team. On a personal note, that era's separation of web and print enabled the existence of Subway Squawkers. Lisa and I will always be grateful to our editor Kevin Hayes for giving us the space on the Daily News website to create this blog in 2006. One of the smartest things I did at the News was to team up with a writer as talented as Lisa. It was Lisa's piece on the Daily News "Firemageddon" that inspired me to take a crack at writing my own. During my almost 13 years at The News, I went through numerous redesigns of the website. In the early days, we fought with consultants who told us that it was too complicated to create columnist pages where each columnist could have their work archived. Later redesigns would attempt to make the columnists hard to find. It never made any sense to me that the powers that be would seek to minimize that value of the unique voices that make up the heart and soul of the New York Daily News. It still doesn't make any sense.